SwaziTelecom has set up WiFi Hotspots in selected malls and shopping centres in the country. These WiFi Hotspots have been branded MySpot. MySpot gives customers Internet access anywhere anytime. This innovative and cost-effective service allows customers to access the fastest, most reliable broadband internet on their devices at specific public MySpot Zones - which are strategically located across the country. 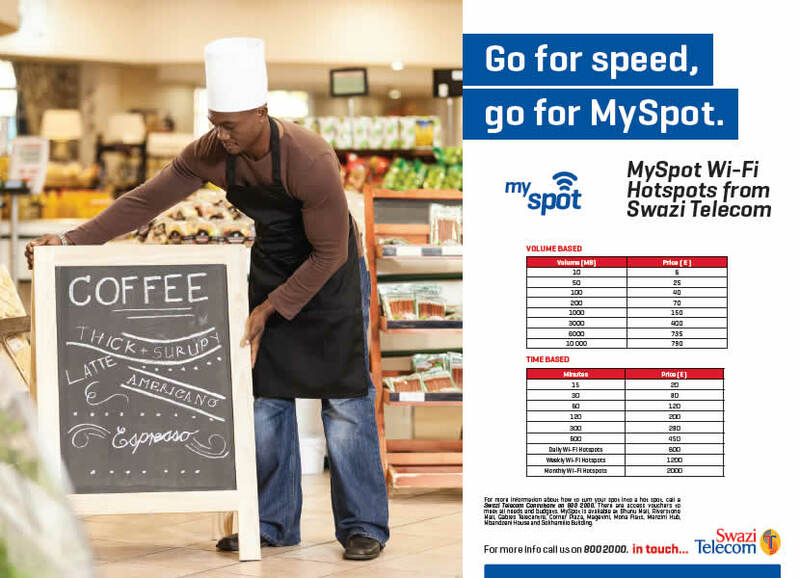 To connect using MySpot customers have to purchase a prepaid voucher from authorised distributors and recharge via the Swazi Telecom MySpot portal. Customers can use laptops, tablets (iPad, Samsung Galaxy Note, Google Nexus 7), smartphones and any other suitable portable devices that are Wi-Fi enabled to access Swazi Telecom MySpot. Internet access through MySpot Zones is suitable because you do not need any extra devices such as modems to connect. Other operating systems are compatible with Swazi Telecom MySpot as long as the device has Wi-Fi capability. In this price offering you are charged based on the fixed volume of data downloaded. The vouchers can be used in any site where there is a SwaziTelecom Hotspot irrespective of where it was purchased i.e. a voucher bought at Bhunu Mall can be used at the Gables. If you have username and password, enter them as indicated in the landing page and click the Login button, if the details are correct, you will see a success page with connection details, you can now open any page or start browsing. Click register, a page with your login details and PIN with charge will be displayed, click the goto Login page to take you back to where we started, for you to now put your username and password to start browsing. This takes you back to step 5. If you have a username and a password, but don’t have enough credit, on the button of self-service, click recharge instead, and follow the steps.